Again, I am kind of cheating. But, this recipe was new to me. And it's tasty - so I think you'll forgive me. I am a fan of all Latin foods. 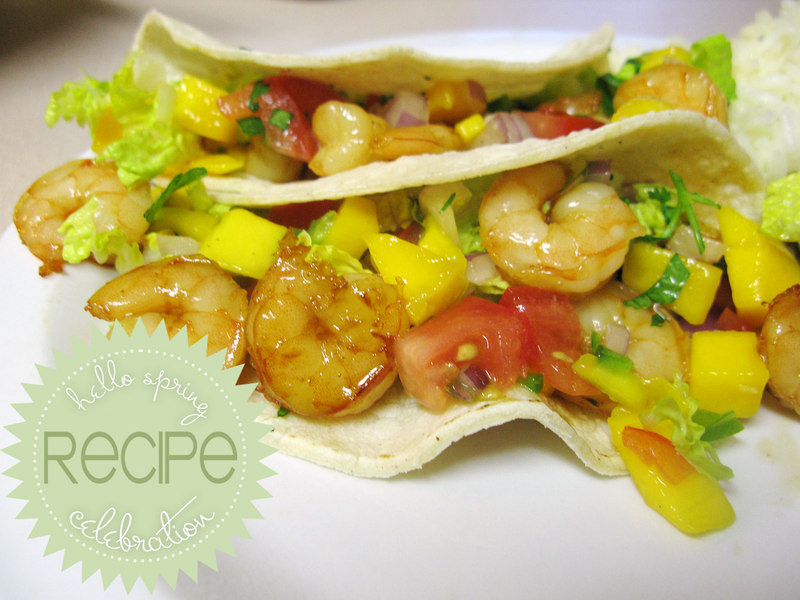 There is a local restaurant that has these Shrimp Tacos with a mango salsa that I quite like. Only thing is, I am a little too cheap to buy them every time I want them (which can be fairly often). So I decided to make them myself. Plus, it is probably healthier and better tasting. For salsa: combine all ingredients in a bowl. Taste test, adjust seasonings. For shrimp: Melt butter and honey in fry pan. Toss in shrimp, season with salt and pepper. Cook until just pink. Place in warmed corn tortillas with mango salsa and shredded green cabbage if desired. Serves 4-5 with leftover salsa. 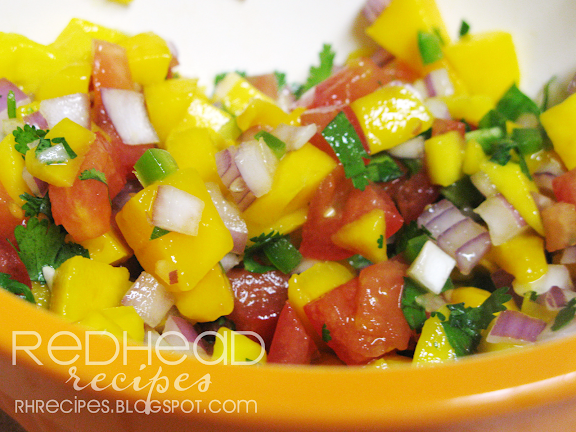 This salsa is great on any protein - chicken, fish, pork. Plus, there will be leftovers to have with chips as well. If you want mild salsa - remove veins and seeds from jalapeno, for medium - remove half, for hot - leave it all. I'm emailing this to my fiancee right now--dinner is done! Oh yummmmm... those tacos look so delicious. I am printing the recipe right now. Thanks for sharing, Sarah. Can't wait to make them. I'm coming over right now! You do have leftovers, right?!?! Yum! Those look so good! I bought shrimp yesterday, and I almost bought mangos, and now I need to! Are the tortillas flour or corn? Nancy - they are white corn tortillas. I prefer the taste of corn, plus they are healthier. Everyone else - let me know what you think when you try it! Mmmm these look great. Thanks for the post. I made them for lunch today and loved them. Soooo yummy. Definitely going to make them again. Thanks. ummmm... how did you know I LOVE shrimp tacos. I shall make these very very very very very very soon. Wow; these look amazing...I love tacos...thanks for this great recipe...this is such a beautiful picture! Love the colors!